British consumer prices are rising at their slowest annual rate in more than a year. That will give the Bank of England more flexibility: the central bank will feel less pressured to tighten monetary policy if unemployment falls more quickly than it has anticipated. 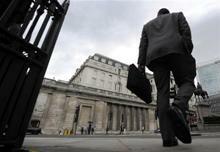 Britain’s annual inflation rate fell to a 13-month low of 2.2 percent in October from 2.7 percent in September. It was below economists’ expectations of 2.5 percent.